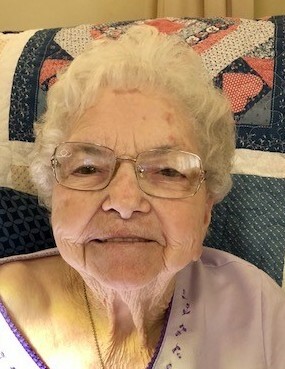 Age 89, of Camden, went to be with the Lord Sunday, February 3, 2019. She was born February 12, 1929 in Hamilton, to the late Robert and Martha Harding. Along with her parents, Treva was preceded in death by her husband, Bill; son, Merle; sisters, Nita Koons and Fern Vest; and brothers, Robert, Bill, Frank, Dallas, and Ruford Harding. She is survived by her daughter, Pam “Squeek” (Wendell) Barrett; grandchildren, Wendy (Dan) Woodard, Dale (Michelle) Adams, and Jamie Adams; great grandchildren, Maddie, Rian, Brenna, Jake, Korrie, Mason, Logan, and Forrest; nieces and nephews; and family and friends. Treva was a long-time resident of Camden, and enjoyed crocheting and attending church. The family will receive friends Thursday, February 7 from 5-7PM at BALES’ FUNERAL HOME, Camden. The funeral service will begin at 11AM on Friday, February 8 at the funeral home with Pastor Debbie Richardson officiating. Burial will follow at Fairmount Cemetery, Camden.